thanks for your website. what a need there is for something like this. Here’s the story of the stray plus a photo. I’ll get more photos after he gets out of surgery. let me know if i should do anything else. Thursday 3/18 at about 6 am I was driving down a dark street and barely made out an object lying in the road. It was a black chow mix. A neighbor saw a car hit him and speed off without stopping. The dog was alert but in a lot of pain. I waited two hours for animal control to show up. They helped me get him in my truck and I took him to an emergency vet. He has a broken humerus and multiple fractures of his pelvis. But other signs looked normal, no internal injuries. Broken bones can be mended. But it requires surgery that can only be done by a specialty vet. 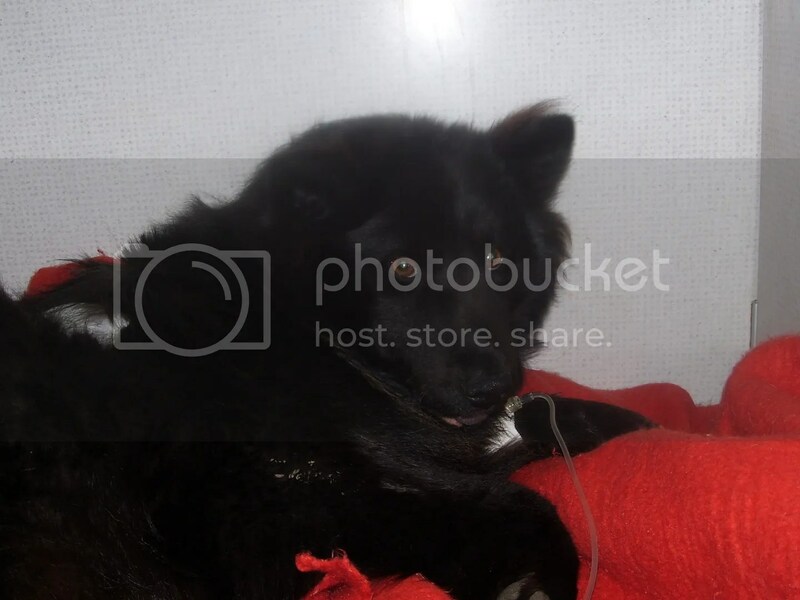 That coupled with the emergency vet care to stabilize him shot up the costs astronomically to over $7,000. I hate the thought of putting down an animal whose injuries are so curable. So since Thursday I have been searching for alternatives. I have two non-profits who have pledged a total of $1430 so far. He will need three surgeries – one for the humerus, two for the pelvis. Maximum fee $5,000. This vet generously cut the fees almost in half from the original $9400. He also lowered the down payment from half upfront to only $500 upfront. And he will let me make monthly payments of $660 for six months instead of paying in full at release. These were all extraordinarily generous concessions, and against protocol. I am very grateful. But still a lot for me to cover on my income. I make about $23,000/yr rehabbing properties in my low income neighborhood and renting them. It takes me a long time to finish a place. I do almost all the work myself. Right now I live off 5 rental units. A lot of people think it’s crazy for me to have taken things this far. And they’re probably right because I don’t know anything about this guy. But he just has broken bones which are fixable. And I’d rather err on the side of compassion than practicality. If anyone can contribute any amount to either location – you can call and explain what it’s for. both vets should be able to verify costs and validity. also dog will need about 8 weeks to heal, so if you know anyone who could foster or adopt him in the indianapolis area – please have them call me. i have 2 chow mixes of my own and they’re a handful. i also have front and back porch steps – all of which would make it very difficult to care for him. « Max Needs some Tests done can you help?